A cycling way of life… as a family…how is it done? Where do you live? We live in Saskatoon, Saskatchewan, Canada. Careers/jobs? Duane is a certified prosthetist (makes artificial limbs), and I am a student at the University of Saskatchewan, majoring in linguistics. I also work for the University Language Centre with international students, teaching english and introducing them to Canadian culture. Ages?Duane is 32 and I am 31. How long have you been commuting by bikes as a family and or individuals? For as long as I can remember I have believed that if you are able, you should power your own mode of transportation (ie, walking, cycling). Although I had a vehicle it remained parked in my driveway while I made my way around the city by foot and by bike. I finally fully committed to the cycling way of life in 2006 when my car died. Duane has been car free since roughly the same time. He made a long haul journey from Vancouver, BC to Calgary, AB over the mountains on his bicycle, and has remained committed to his bike ever since. When we moved to Saskatoon in 2008, I have to admit that I was somewhat nervous about cycling through the winter, but now that we have been doing it for the last 3 years I feel empowered and freed by our decision. I believe the ultimate reason we both separately began living by bicycle had to do with the fact that Duane had just gone back to school and he didn’t want to invest in a vehicle, and that the transit system in Vancouver was so accessible that he felt he didn’t need one. I basically didn’t want to invest in a vehicle after my old one had died and also found the transit system in Vancouver to be more than adequate. There was no need for a car in that city. The real challenge came when we moved to Saskatoon. It was then that we made a conscience decision to be without a car, and to use bicycles as our main mode of transport. The transit system in this city is lacking and we found that cycling was actually much quicker than riding the bus. What is the best part of commuting by bike in your city? There are a few great aspects of riding bike in Saskatoon. One of them is that it is an incredibly flat city, so rarely are you faced with a challenging hill. For this reason, all demographics of people are capable of riding. Also, because it is a small city, it doesn’t take you very long to get from one end to the other. There is also quite a large cycling community here so there are many people of like mind. At every festival they offer a bike valet where you can drop off your bike at a location and it is taken care of. The worst part about cycling in Saskatoon is that it is a city comprised of people who have moved from small towns and farms. They don’t know about or value other modes of transportation and they want to drive their big trucks and maintain their single occupancy vehicles. It seems as if there is a lot of hostility from drivers towards cyclists here, and there are often confrontations that take place…sometimes on a daily basis. There is a real lack of knowledge about bike safety and a real lack of cycling infrastructure. This is something that a certain bike advocacy group in the city is trying to remedy. How do you plan to commute now that you have a little one? We just had our first child a month ago and this new addition to our family has not changed our resolve to remain carless. 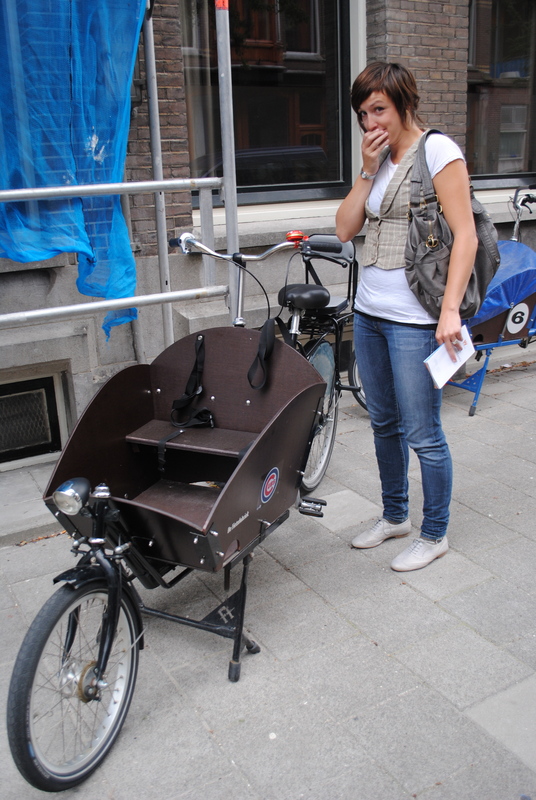 We visited Amsterdam last year and were introduced to their specific style of cargo bike. We decided that if we were going to have children that we would need to have something like this. My husband has begun building this bike with a friend, and when finished we will be able to lash a car seat to the box and transport our baby. When she is older, the box will have a bench seat that she can sit in while still being able to haul other cargo. Throughout this coming winter we will likely walk most places or use public transit. How do you deal with the weather challenges in the colder months? Cycling in the winter is not as bad as most people initially think. When people drive places they don’t dress appropriately to handle the cold so they automatically think that it must feel the same if you are cycling. The truth is, we are so well dressed that we never feel the cold. Also, because we are constantly moving (and because cycling is innately more difficult in the snow) you get hot quite quickly. The best way to battle the frigid temperatures is to make sure that there is no exposed skin. Ski goggles, neoprene face masks and snowboard helmets to keep your head warm. A sweat wicking shirt, and a winter coat maintain the core, and polypropylene long johns, wind pants and warm boots keep your lower half well protected. Because I tend to get cold easily, we have found that small hand warmers in your mitts help to take the edge off. Studded tires are also a necessity. Favorite trail or area to ride near you? Saskatoon is known as “Bridge City” with 6 bridges that span the South Saskatchewan River, which flows through the centre and along downtown. There are trails along both banks that are beautiful and bike friendly. Best bike shop in your city? The best bike shop in town is Bike Doctor. They are locally owned and have knowledgeable staff, great mechanics, and ample supplies. It’s important to be “Cyclelogical” for so many reasons. We live in an era where there is constant concern regarding the environment. Riding your bike immediately deals with this issue. You become a part of the solution, rather than a part of the problem. Also, riding your bike simplifies life. People think that it complicates things, but you never have to worry about expensive repairs, paying for gas, or parking (you always get the A-spot), and you spend your time taking the trips you want to. 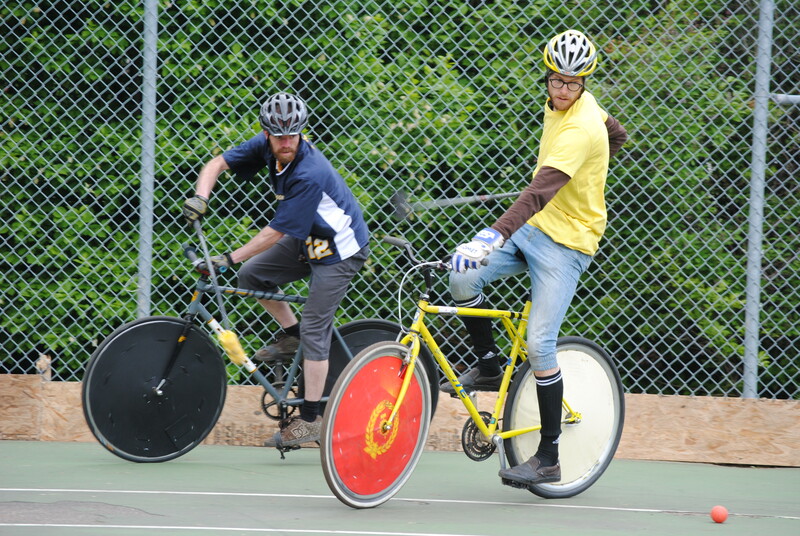 Cycling is also a great way to maintain general health without ever having to step foot in a gym! Your commute becomes your daily exercise, and is much more interesting and fun than a treadmill in a sweaty fitness centre. Any suggestions/websites/ info for those wanting to be a bike only commuting family? I feel that it is important to note that cycling is much more than simply a mode of transportation for us. We have come to enjoy it as a form of recreation. We still love taking leisurely rides along the river, we participate in alley cat races around the city, and Duane is a regular fixture in the bike polo scene. There is also a family friendly critical mass that takes place once a month in the summer called “Kidical Mass” that we have attended prior to having a child, which we look forward to partaking in next summer with our daughter. Cycling is very much a lifestyle that we have fallen in love with. A website that I read regularly is http://www.girlsandbicycles.ca/ It’s a fun read about bikes, fashion, and food.http://bikegeekbrown.blogspot.com/ is blog written by a friend here in Saskatoon who is also carless and manages to be so with his wife and 2 kids. These following links are great reads and resources for people who are interested in living carless or in bikes in general. Categories: bike, commuting gear, Cyclelogical, cycling, family | Tags: bicycle, bicycling, bike, cargo bikes, commute, commuting, cycling, family life, lifestyle, Saskatoon, winter riding | Permalink.